Sleeping is one of the most natural things in the world. Yet, it can be so very difficult for so many people. If you have trouble sleeping at night, you are certainly not alone. Millions of Americans struggle each night with insomnia. Those who struggle to sleep at least three nights a week for three weeks in a row are considered to have chronic insomnia. People who struggle to sleep can have all kinds of different physical, emotional, and mental side effects that impact their daily lives. Memory loss, physical illness, depression, headaches, decreased work performance and a higher risk of accidents are just some of the problems that can be caused by not sleeping well. Insomnia is clearly a serious health concern that should be reported to your doctor. Insomnia can have many different causes, but one common problem is related to stress and anxiety. When the body is tense and mind is stuck thinking about various stressful topics and events, your ability to go to sleep is deeply impaired. People who can reduce their stress levels have a much better chance of battling their insomnia as well. Can You Use Massage Chairs for Insomnia? Instead of heading over to the pill bottle, which can have detrimental side effects, many stressed-out people are searching desperately for natural ways to cure insomnia. And using a massage chair may very well be the answer for these people. The health benefits of experiencing daily massage have been studied and documented. One of the important benefits we care about related to massage is its ability to help you get to sleep at night. 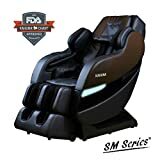 Since getting a professional to provide you with a massage each and every day is inconvenient and expensive, many people find that having a massage chair in their own home is helpful. Using a massage chair for insomnia can change everything about the way that you sleep. 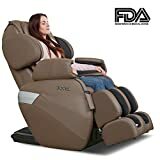 Massage chairs offer relaxation and stress reduction, which is often a problem that keeps people from getting to sleep and staying asleep all night. Chronic body aches and pains are another reason that many people are troubled by insomnia, and a massage chair could easily help with this problem. Some massage chairs even have specialized programs which are made to help the user relax and promote healthier patterns of sleep. People who struggle with insomnia should take it very seriously. And when it is combined with physical aches and pains, it may be even more realistic to consider the use of a massage chair to beat problems with sleeping. Taking advantage of the use of a massage chair at home every day in the evening could change everything about the way that you are able to sleep. Stretching, Pain Relief, Relaxation, and other special programs to maintain health. Top performing technology to accommodate smaller and larger body types. 6 rollers to simulate the use of actual hands during massage. Zero-Gravity positioning for extra health and relaxation purposes. Heating therapy for additional comfort and coziness. Zero Gravity technology to help with full body health. 2 heating pads in lower back area to promote healthy circulation and sleep. Multiple air bags foot massager that works with reflexology points to relax and heal. Massage chairs can be helpful for all sorts of health related concerns that reduce stress, boost the immune system, reduce depression, manage stress and anxiety, and generally lead to an overall healthier lifestyle that includes better sleep! Beating insomnia isn’t always easy and may take some time, but using the tools available to you will help. If you have regular access to it, you’re likely to find that a massage chair plus a better sleep hygiene and stress reducing routine can battle those sleepless night sin a natural way. With care and attention, you can take your life back from insomnia!